Dr. Leon Powers will soon be featured in and Idaho Birder Profile. In a couple of e-mail exchanges with him recently, he tells me that his third book The Forgotten Expedition is its final stages, just about ready to be published in June by Look-About Books. He sent me a courtesy review copy of his last book Dead Owls Flying (2008). 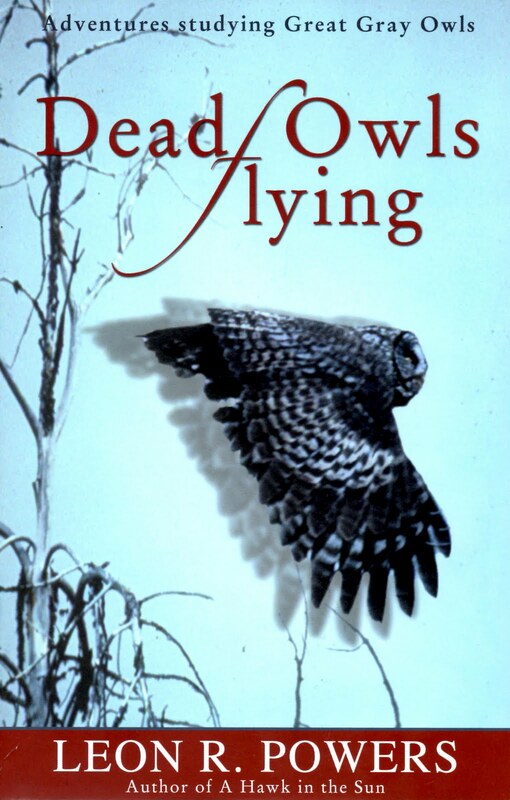 Dead Owls Flying is the delightful account of Dr. Powers' study of Great Gray Owls in the central mountains of Idaho known as Long Valley. His principal areas of study were in Cascade, Donnelly and McCall. I got pretty excited when I saw that his first ambitious student researcher for the Great Gray's was Mike Munts who has been featured on this website before and with whom I had gone snow-shoeing at Craters of the Moon National Monument. (Mike, that youthful photo of you in there with the owl is priceless!) I also felt a personal connection to this book. Last year I was fortunate enough to see my life Great Grey Owls on Loomis Lane in Donnelly, a major study location of Dr. Powers and his students. Perhaps I saw the same owls he knew, named, and studied, or at least their decsendents. This book is the passionate tale of the adventure of studying Great Gray Owls, and not a tedious thesis. I really enjoyed Dr. Power's plays on words and his writing style that kept me interested on every page. The observations of the owl behaviors were fascinating as well as their methods for tracking and banding. Readers come away with a greater understanding of Great Gray Owl habitat and the reverent desire to preserve and protect it. The book paints a dismal picture for the Great Gray Owl in Long Valley, thus the title Dead Owls Flying, but in the last chapter, Dr. Powers offers a line of action to protect this essential habitat. The historical background on the area and the impending habitat doom due to what is now known as the Tamarack resort also piqued my interest. It seems as if the west mountain area near Cascade is cursed against being fully developed (or blessed depending on your perspective). It has changed hands and names so many times and is currently in a dismal state. As a former "evil" land developer myself and an avid birder, this situation tears at me up inside. I see it from both positions. Its location is gorgeous and I can understand why people would want the resort there, but it continues to fail after several decades of attempts. Maybe those ghostly Great Gray's have used their magic to preserve a promised land for their progeny. I wish I could have it both ways; the great resort and the Great Gray Owls. But is it even possible? I am hopeful that it is possible if the development can find a way to integrate habitat preservation and continual study. Dead Owls Flying also got me to thinking about the Long Valley area and Great Gray Owl's prior to mankind inhabiting the area. I can't imagine that bird populations have ever been static and that there is such thing as an ideal population for any given species. That's one thing about nature, it is often cyclical, and always changing. This book clearly establishes that Great Gray's need old forest immediately adjacent to meadows. I suppose that prior to mankind, wildfires in Idaho's pine forests caused by lighting continually created the meadows needed by Great Gray's. Certainly water flowing through the area also created meadows. Unless a meadow is preserved by continual fire or water it will eventually revert back to forest. When a new meadow due to a fire would open up, I imagine the owls would move accordingly. Enter mankind, ranchers and farmers. They clear the land and thereby create "artificial" meadows. Some meadows are overgrazed by cattle and sheep and therefore not conducive to the voles and gophers that owls eat, but many man-made meadows are perfect habitat for them. I am hopeful that we can co-exist. We just have to think about it and act accordingly. Besides being an enjoyable book to read, I suppose that is the point of any naturalist's writings; to make the reader think and then act to protect within their circle of influence. Dr. Power's writes so well and captures your heart. This is a must-read book by birders and naturalists everywhere. I would like to read this book. You bring up some interesting points, many of which I have contemplated myself. I hate to see true beauty destoyed for development, especially for McMansions that only the rich can afford, and for cookie cutter housing projects. I do believe man and nature can co-exist and I read another very interesting story on the same subject. It happened in a place nearby to you in Oregon called the Zumwalt Prairie. Mary Houle, the author of that book was there doing research about the effects ranching on the raptor populations. Her research put her in the cross fire with ranchers, wildlife biologists and BLM managers. What her research revealed was truly interesting. The book is called the Prairie Keepers. You might want to give it a read! Nice book review! Well written and thoughtful. I'm going to have to check out this book. Thanks for the review!